The beautiful flint barn at Breaky Bottom and the adjacent studios in the yard date from 1827. Natural England has offered us a generous grant to restore the roofs to their original state, of slate and peg tiles respectively. We became eligible for this scheme when we entered into a Higher Level Stewardship agreement wherein we guaranteed to care for the holding in an environmentally sensitive way. 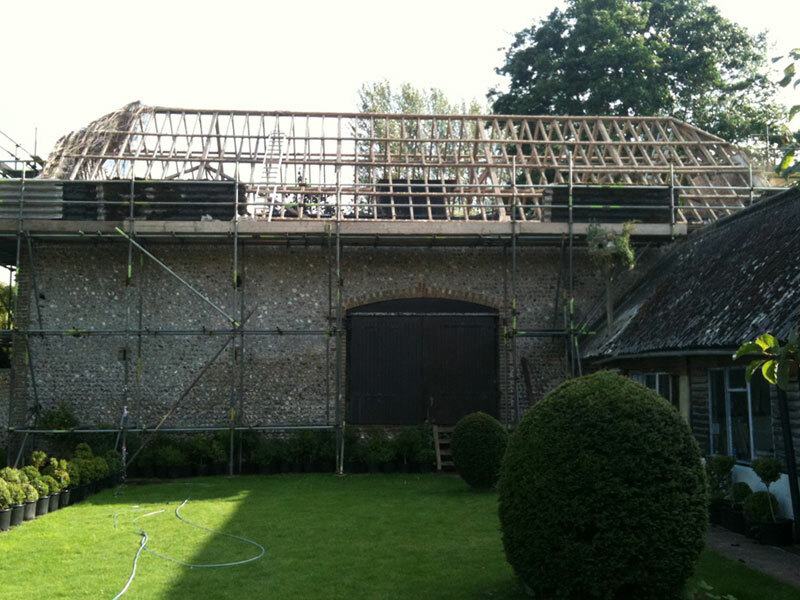 The picture below shows the barn already re-roofed and the workshops covered in a blue tarpaulin, awaiting the new clay tiles. You can just make out the Exmoor ponies we use to graze the coarse Tor grass on the steep bank to maintain this HLS status – encouraging the finer chalk species to flourish. We were delighted when the Chardonnay/Pinot 2008 'Cuvée Princess Colonna' was selected by the Government Hospitality cellars at Lancaster House, St James's, as part of the celebrations for the Queen's jubilee and the Olympic Games. Awards this year include the 2007 'Cuvée Francine' which won Silver medal in the Decanter World Wine Awards and the 2008 'Cuvée Alexandre Schwatschko' a Bronze medal. The 2008 'Cuvée Princess Colonna' won Silver medal in the International Wine Challenge. I have for years taken pleasure bird watching in and around Breaky Bottom. The great and the small are all my delight. Sit still in one place for a while and one becomes an accepted part of the landscape. Barn owls are now permanent residents in their well-appointed nest box and this year reared two males who can be regularly seen at dusk, quartering across the rough banks in search of unfortunate short-tailed voles. Buzzards are now common-place and I have seen as many as six together this summer, soaring high overhead. Years ago Lapwings were very common in the Downs at a time when spring sown barley was the main corn crop. Now that winter sown wheat is the norm they have become rare in these parts. The crop is too well grown for the ground-nesting birds to afford them a good look-out and they nest here no more. But this morning, although in deep winter, I had the pleasure of seeing a great skein of 60 or more Lapwings flying quite low over the buildings, as if inspecting the smart new Natural England roofs. They are the first Lapwings I have seen here in 20 years or more. I hope some will return at nesting-time. 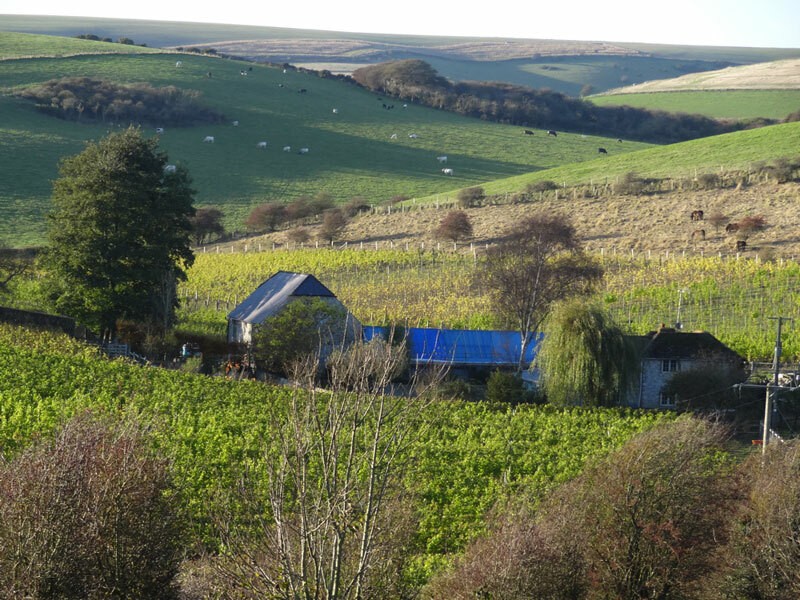 All the wines mentioned in this Winery Note are available from the vineyard, by Mail-order and phone, or by email for Christmas and the New Year. Local delivery is free - Please call me if you need further advice!